Lines and geometry punctuated by color and light. Mathematics made sacred. Commanding notes swoop and swell, surging against the vertical sweep of architectural engineering, bolstered by orotund baritones. They gather and tumble, slowly building, building, fuzzing my spine, snatching my breath. Conjured by music, light shimmers and crystalizes, transmuted to form, to flesh. The notes, transfixing in their power and might, melt to sweetness. I exhale, released. Following the vertical climb of the narrow column of stained glass, I ascend deep blue, into aqua, into yellow-mottled light green, before sublimating back through hot, rich magenta and purple. 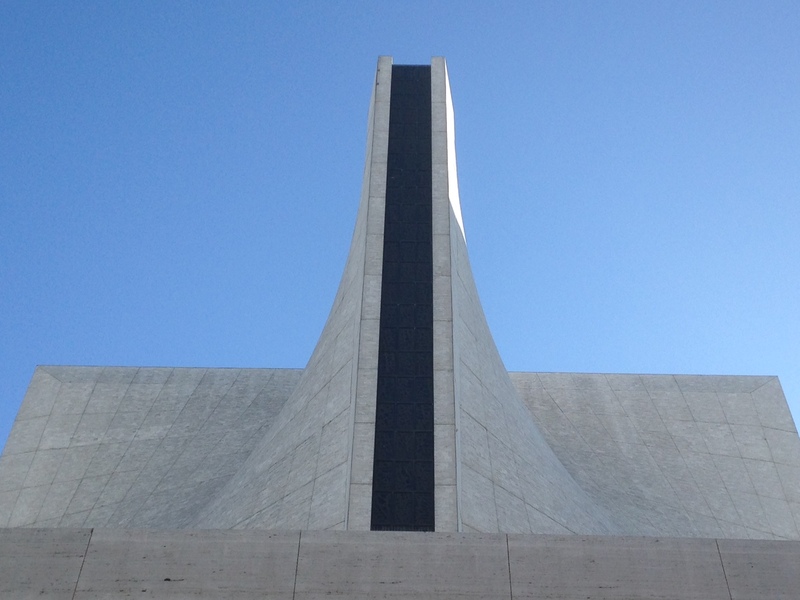 St. Mary’s Cathedral hums with the spiritual, yet is solidly tethered to the bulk and weight of this physical earth. The stained glass is a fractured, chromatic abstraction. In place of an altar crucifix, there hangs an unadorned cross. 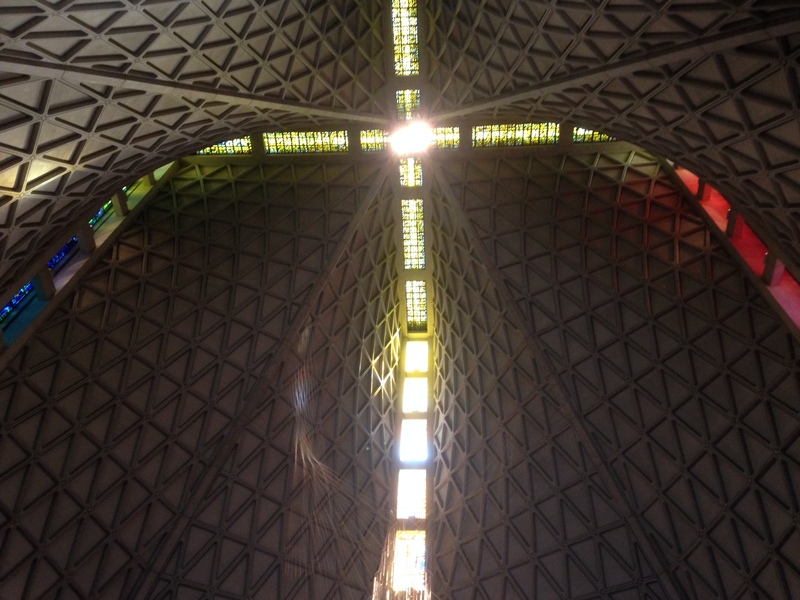 Unfiltered light passes through the thin membrane of broad, high windows encircling the nave. Pews visibly share space with the neighborhood high-rise apartments. 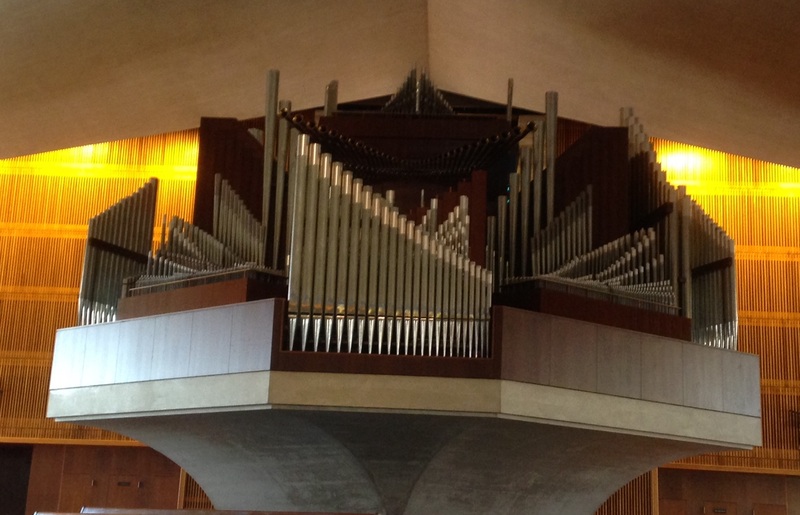 But when the pipes of its magnificent organ quiver and bellow in prayer, the cathedral vibrates into another plane. A void of peace and still; a tumult of emotional fervor. The Cathedral of Saint Mary of the Assumption, located at 1111 Gough Street, is the principal church of the Roman Catholic Archdiocese of San Francisco. Their weekly Mass schedule is available online. If you don’t wish to attend Mass, you can visit at any time or meet with a docent from 10 a.m. – noon Monday through Friday, 11 a.m. – 1:30 p.m. on Saturdays, and after Mass on Sundays.